Taken at my sparrow feeding station at my home in Carlton County, Minnesota. Who has an idea for a caption? Contribute your caption here or on my facebook page here. Let the puns fly! 2012 is gone and I’ve had a chance to look at all my images from the year and pick my favorites. Time helps clear your vision. Some images I was crazy about right after I took them, are no longer exciting to me. Here I present my favorite images of 2012 in reverse order…Maybe not the most saleable nor necessarily the best portraits (which can be boring), but the shots that I kept coming back to..the ones that intrigued me…or were difficult to get…or were the most creative. And this last bit about creativity brings me to my big announcement for 2013…I will be releasing a new video: GET CREATIVE: WILDLIFE IMAGES BEYOND THE PORTRAIT this year. Stay tuned! #20—The surprise image of the year…I was perusing photos from my June work for the Minnesota County Biological Survey when I found this very underexposed, blaah image. But then I saw the potential as a high-contrast black and white image. The result was a very graphic silhouette of a foraging Pine Warbler amongst the long delicate needles of a Red Pine. St. Louis County, Minnesota. #19—I spent much quality time with our backyard hummers this summer. We mainly hosted females but occasionally a bully male would show up…but never when my camera was in place. I was using flash and a Better Beamer to throw light onto the hummer but in this shot the flash did not fire. But I like the resulting softer look…No harsh light blasting the tiny bird. My home in Carlton County, Minnesota. #18—Fall leaves always seem to vex me…I have a hard time creating interesting images of the stunning scenes around me in late September/early October. On this windy day I used a tripod and a very slow shutter speed to render the leaves a colorful blur while the trunks remained relatively still. I like the contrast of white vs. orange and blur vs. sharp. Rock Pond, UMD, Duluth, Minnesota. #17—Eye-level Bald Eagle shots are not easy to come by! And this one has a story…It was taken 80 feet up in a firetower! I was visiting Big Bog State Recreation Area in far north central Minnesota and decided to climb the tower to get a bird’s-eye view of Lower Red Lake and surrounding forests. Some distant eagles caught my attention and I thought, wouldn’t it be cool if one flies past me in my aerial perch…And the miraculous part is that one did! It was not a gleaming white and black adult but rather a dramatically patterned youngster. I panned with the bird and amazingly it came out razor sharp. #16—I cross this bridge over the St.Louis River on the outskirts of Duluth every day on the way to work. It has many moods and this hazy spring afternoon created a bucolic and blue still life of swans, ducks, ice and trees. #15—My youngest son, Bjorn, shows great promise as a wildlife photographer…At least he looks good in khaki! #14—Not a set-up! A fortuitous find that resulted in a very nice portrait with a little behavior too. This very rarely happens but it did this August morning on the Gunflint Trail. I’d just returned from a early morning paddle on the Brule River, loaded up the canoe and was pulling out of the dirt parking area when I spotted the foraging Cedar Waxwings in a heavily-fruited Mountain Ash. #13—Just a very pleasing composition (to me anyway)…a water lily on dark water taken from a low angle to get the reflection. I also love the purplish lily pads. Cook County, Minnesota. #12—A very long exposure with my 10mm Sigma lens was made possible by a 9-stop ND filter. I love the soft ethereal feel of the powerful Lower Falls of the Yellowstone River, belying the thunderous roar. Yellowstone National Park, Wyoming. #11—I had to include this portrait as I have been trying to get a decent winter Snowshoe Hare photo for years! And on this snowy Sax-Zim Bog day, I succeeded! The hare really felt it was invisible and stayed put as I crawled closer and closer through the snow. #10—Seems like I always slip in a non-nature subject. I really enjoy photographing vernacular architecture, including abandoned buildings like this farmhouse. A HDR image and sepia color finished it off. 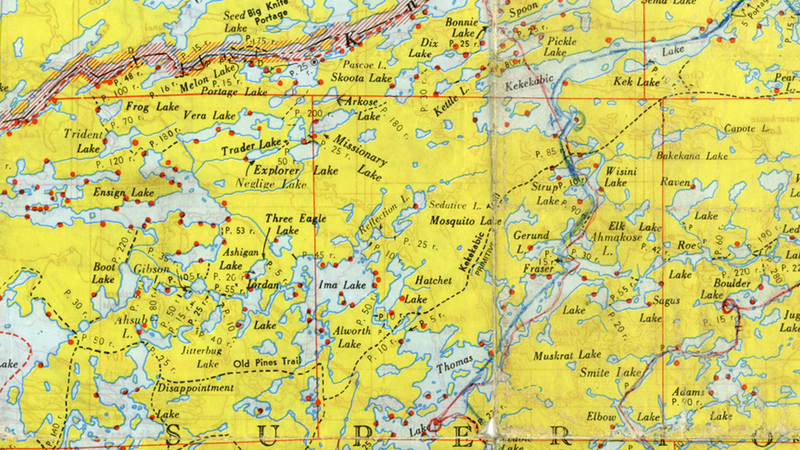 Itasca County, Minnesota. #9—Abstract macro image of a Polyphemus Moth’s wings turned upside down to create a strange “face” complete with big blue eyes and a puckered mouth. My home in Carlton County, Minnesota. #8—The banner headline of 2012 for us Duluthians/Carltonians was the Great Flood of June. It affected all of us dramatically. But my most powerful image was this shot of the raging St. Louis River taking out the historic and much loved Swinging Bridge of Jay Cooke State Park. Read more here. #7—A rite of spring, the congregation of Sharp-tailed Grouse at their dancing grounds or leks, is an event I hate to miss. But it is always difficult shooting. They are most active just before sunrise when the light is poor…And it is April so the weather is often cloudy and windy. Visibility in the cramped blind is not great either. This time I resorted to a slow shutter speed and panning. I love the shot as it conveys the manic intensity of the males as they dance, pursue females, and chase off rival males. Carlton County, Minnesota. #6—One of the few straight-up wildlife portraits in the collection, but I had to include it. Much has been made of the dramatic decline of Moose in Minnesota…and it makes me very sad. They are one of my favorite mammals. I learned to call Moose years ago…imitating the sound of a female. After a several-year dry spell, I was able to call this young bull in this fall. Intense moments followed as he was deciding whether I was a cow Moose or some stupid human. Thankfully he came to the right conclusion! See the video here. #5—Can you tell what this is? Colorful river rocks below a Yellowstone National Park stream. It’s funny…I really don’t like abstract painting but I love much abstract photography. #4—Two icons of Duluth in one shot! The Aerial Lift Bridge and a Ring-billed Gull. Not your typical wildlife shot but one that is certainly unique. In this technique I learned from flash/lighting guru ??? you set your camera to tungsten white balance (to turn the dark brooding sky blue) and then use a flash with an orange CTO gel to throw a very warm light on the subject, in this case, a Ring-billed Gull. #3—Often times I’ll get home from a trip and when viewing my images in Aperture, I’ll come across an unexpected prize. It’s like Christmas as a kid! I thought I knew what my favorites would be from viewing them in the field on the back of my camera…but I’m often wrong. This is one such image. 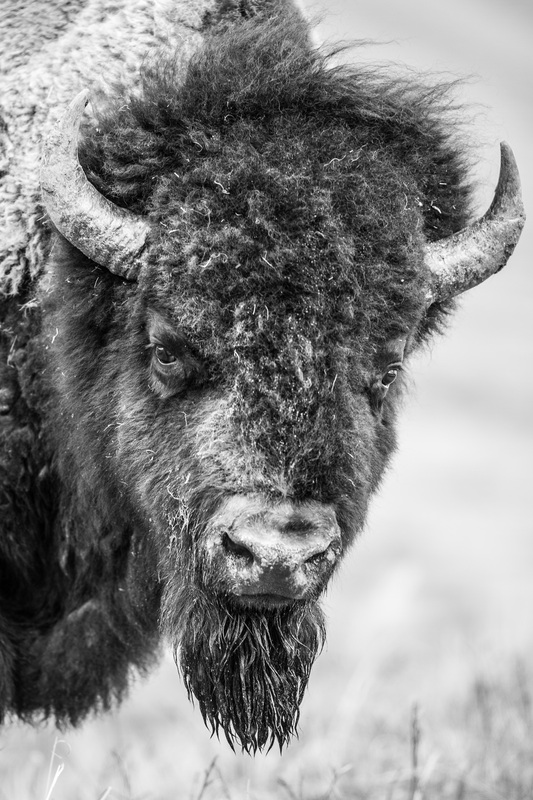 It was taken into the sunlight to backlight the Bison’s fur…but it was mostly a “G&G” shot (grab-and-go)…No premeditation, No tripod…Jump out of the car and “snap.” But after converting the image to sepia, I really loved it. Yellowstone National Park, Wyoming. #2—I really concentrated on wide-angle wildlife this year and this may be my favorite. Crawling on my knees for hours on an Iowa prairie in September finally netted me this image. Read the whole story here. Northeast Iowa. #1—Drumroll please…My personal favorite from 2012. Read the whole story of this bog encounter here. See the video here. I like the Great Gray Owl’s furtive glance around the trunk of a spruce…It lends an air of mystery. It is very “Brandenburg’s-wolf-peek-esque” if you’ve ever seen his famous photo. Sax-Zim Bog, Minnesota. The whole family has had a blast watching the Ruby-throated Hummingbird antics at our backyard feeder this summer. We’ve had up to 4 around the feeder at once. Though there are six feeding holes in the dispenser, they seem unable to feed peaceably next to each other. Fights are non-stop. For a while we had the “bully,” a male who sat like a king on his throne on the hanging bracket and chased away any nearby hummer…even when he wasn’t interested in feeding. The last few summers we’ve had the feeder out by the garden, but moving it to the “backyard” was the best move we could have made. Our large picture windows allowed great viewing and also helped remind us when the sugar-water mix was low or out. We used to forget about it when it was by the garden and let it run dry much to the hummers chagrin. 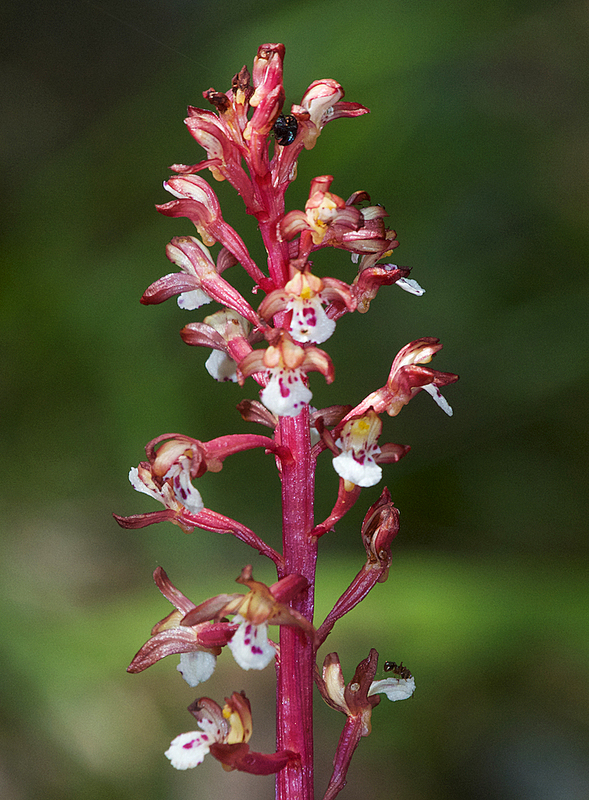 My first goal was to get some photos of Ruby-throats feeding on native flowers…A very difficult shot in the wild. Why is this type of image tough to capture? Because in the wild, you can’t control the situation. If you plant yourself near some highly desirable hummingbird flowers (Liatris, Monarda, Milkweed, etc) you never know when one might show up, and then it will be cautious of that weird large human with the “bazooka” pointing at it. On the other hand, if you stumble upon a feeding hummer, it is highly unlikely that you’ll have time to focus, position the flash, get the correct exposure and fire off a shot before the hummer moves on, as they normally quickly move from flower to flower. The native plant/clamp hummingbird set up. A female comes in to an irresistable Morning-Glory bloom. Here’s where the hummer’s long bill and tongue really come in handy; deep corolla flowers like Morning-Glory “hide” their nectar deep inside. To get clean hummingbird images, you need to control the situation. First I gathered a native and photogenic flower and put it in water so it wouldn’t wilt. I then set up my camera on a tripod about 25 feet from the feeder. You have to judge the distance for yourself and what lens you are using, but you want enough room surrounding the flower to allow for the body of the hummer. You don’t want to be so tight that you clip part of the bird. Err on the side of too much space around the flower as you can always crop later. I attached my flash and to that attached a Better Beamer (a flash attachment that uses a fresnel lens to concentrate the beam of your flash so it projects further). Now, I took the native flower and attached it to the bracket that the feeder was hanging on. I used a regular clamp this time but often use the “plamp” (plant clamp) from Wimberley to do this. One end has a beefy clamp that can attach to tree branches, a tripod leg, or in this case, the hanging bracket. You can then twist and bend the plamp into any position you need. The flower end of the plamp has a swiveling low tension clamp so you can fine tune the flower’s position. Quickly test your set up. Position your tripod so that you will be shooting exactly perpendicular to the feeding hummingbird (if this is the shot you want). This is possible with Morning-Glory but not with Liatris where they can feed on all sides of the flower. Also look for the best background for your images. You don’t want distracting branches, blown out sky, ugly browns in your background. This is a VERY important step that can make or break a photo. Since I am in a very wooded spot, I am especially worried about “hot” branches, branches lit up by the sun that cause very distracting light lines,blobs in the final photo. What I do look for are nicely lit, even green foliage that I know will blur into a smooth green background. I pre-focus on the spot where I want the hummingbird and then turn off the auto focus on the lens. This way I don’t have to be looking through the camera when I’m shooting. I just watch and press the shutter when I think the hummer is in position. Now quickly fire off a few test shots. Exposure is always a compromise between shutter speed and aperture. You want a relatively shallow depth-of-field (DOF) to get out-of-focus backgrounds BUT you also want enough DOF so both hummer and flower are in focus. A delicate balancing act for sure. Most are shot at f5.6 to f6.3. For the majority of these images I used high-speed sync for my flash, shooting at 1/1000 of a second (all but the Liatris images). But I don’t think I’d do this again. I like some blur in my hummingbird wings…It adds some drama, reality, motion into the image…And even 1/1000 doesn’t come close to freezing them…And high-speed sync seems to take more effort from your flash so it doesn’t recycle as quickly as when shooting at its regular 1/250 sync speed. The final key to this operation is to cover the hummingbird feeder completely with a towel. You can also remove the feeder if you like but I found this just an extra unnecessary step. Now plant yourself next to your camera and get ready…finger on the shutter button. Because if you have an active feeding station it won’t take long for the first hummer to come zinging in. He/she will seem confused at first, trying to get at the covered feeder, but then it will see the showy flower you provided conveniently at hummer-head height, and think to itself, “Why not? It’s here, it has nectar, might as well try it” and that is when you start firing off shots as fast as your flash will recycle. But actually I just keep shooting because even non-flash images in a sequence can be beautiful. This set-up really works well on established hummingbird feeders…but only for a few minutes…until all the local hummers have been fooled and tried your flower and used up the nectar. So I immediately take down the flower and uncover the feeder after my photo session…Usually less than half an hour. You don’t want to frustrate your guests too much so they go over to your neighbor’s feeder! My big failure for the summer was NEVER getting a male to feed on “my flower”…I think all the images here would be enhanced with the male’s iridescent throat feathers shining like a ruby in the sunlight/flash burst. Oh well, there’s always next summer! It’s spring! …well, kind of…an inch of snow on the ground yesterday (11 inches an hour north!) and high temps in the low 40s…But time to start thinking about some warm-season wildlife photography…and Getting Close! I’m including a short 3-minute clip from the Get Close & Get the Shot DVD on building a small backyard pool to attract birds…and how to photograph them. It’s easy and fun…and could be especially productive during late May migration or during the heat of summer. Images like this Purple Finch are possible with a tiny backyard pool…and a large dose of patience! Just dig a shallow hole, line it with something waterproof like poly, fill with small rocks, then add either a small waterfall with a hose and some rocks, or a drip. 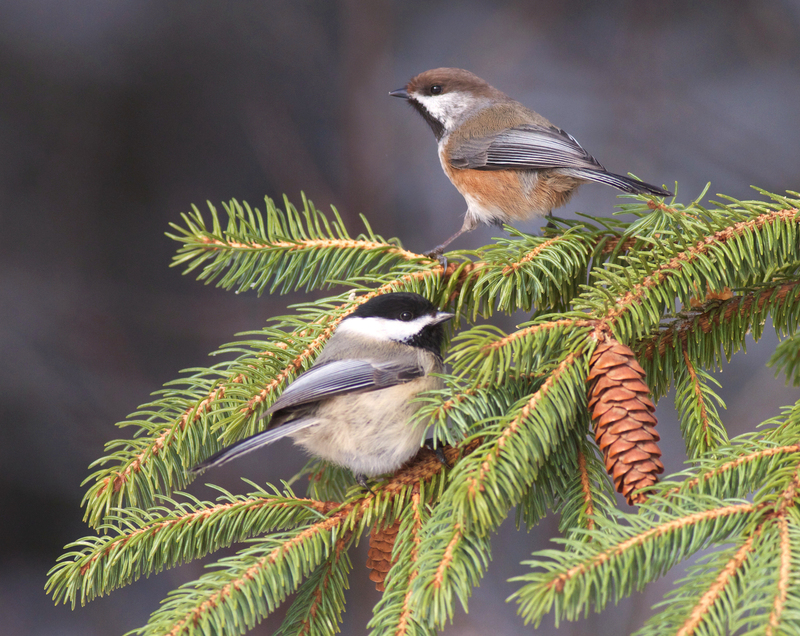 Birds find the sound of running or dripping water enticing. Now set up your blind and wait. 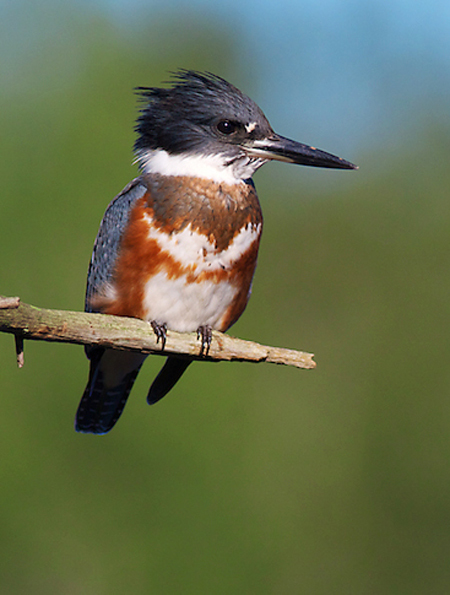 Oh yeah, add some attractive perches if you want some nice bird portraits. Try it out! More details on setting up perches in the DVD. 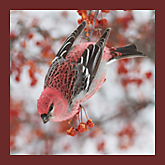 North Woods Journal is a perpetual weekly calendar for keeping track of your nature sightings…and step 1 in becoming a great nature photographer. If you know, for example, that the Sharp-tailed Grouse are normally dancing on their leks in mid April, then you can plan to make a photo blind reservation for that time period. The book is a 8×8 hardcover book normally retailing for $24.95. It features seasonal photos from yours truly and my photo buddy Ryan Marshik. A sidebar on each generic week highlights what’s happening in the woods on average during that part of the year. This is based on my 25 years of nature notes. AND it is meant to be written in! Jot down dates, sketch your finds, staple in photos…I don’t care, just so you use it. This way you can compare the phenology of your location from year to year. It’s a fun and fascinating hobby. If you are interested in purchasing either my Get Close & Get the Shot DVD or the North Woods Journal, go to my online store— www.birdnerdz.net.